Sometimes I am reading a blog and I think, "Other people should know about this!" I usually add it to my blog roll, but I don't think that has the 'shout it from the rooftop' effect I am going for. So, occassionally, I'll share a blog that is tickling my fancy. I have never been so excited about a DIY in my life. 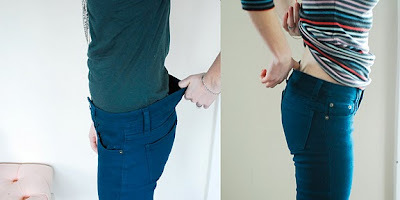 I often buy pants that fit wonderfully through the hips and thighs and gap like crazy at the waist (if you are an hour glass or pear shape, you know what I am talking about). She also posted a tutorial for a simple elastic skirt with pockets a few weeks ago. As well as pointing readers to a tutorial to add pockets to any skirt or dress, freaking fantastic. And to top it off, she's quite funny. Have any of you been following Freshly Picked? Any new blog loves you want to share with the rest of us? Leave a comment! The deal is good ends Monday. 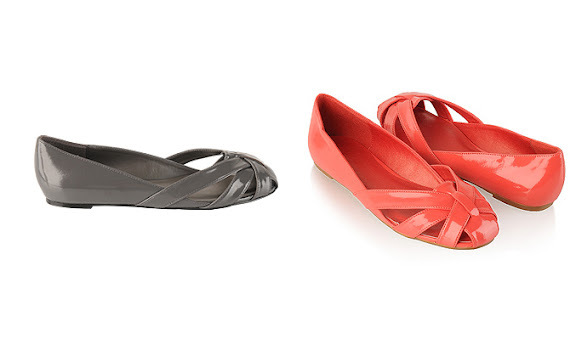 So, if you have been stalking something in J.Crew's Final Sale, now is your chance to pounce! Just yesterday, I was evaluating my closet (deciding what I should put in the boutique) and I decided that I needed 2 specific things to fill in the gaps of my shoe collection: a grey pair or flats and a coral pair of flats. What do you think? 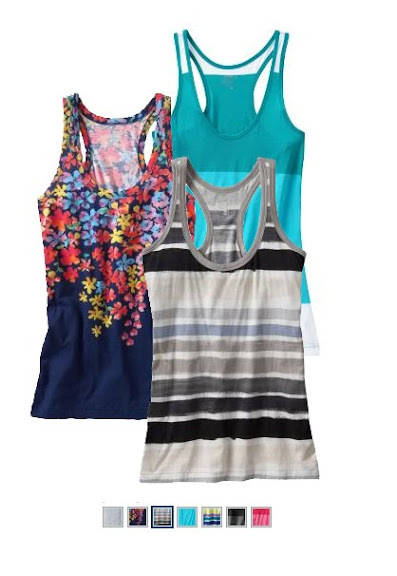 As spring approaches what do you need to fill the gaps in your closet? Leave a comment! Über-Chic for Cheap has openings for sponsors starting in the month of March! Email uberchicforcheap@gmail.com for rates and discounts. In the middle of March I'll be traveling to London and Paris for a school trip for 10 days, and was wondering if you had any advice on packing/outfits to take, etc. Our leaders have advised us to wear tennis shoes and lots of layers because the weather in that region can be unpredictable. Do you have any advice for avoiding tennis shoes yet still remaining casual, comfy and cute? We're going to be doing a lot of walking so I will need a dependable shoe that won't kill my feet. Also I don't want to look bulky in a winter coat with layers so do you have any advice on how to layer outfits in a comfortable way? There is a quite a bit in there. First I'll start with what I found out about the weather in London in Paris in March. According to about.com, Paris in March remains somewhat chilly, with temperatures hovering at around 45 degrees F on average. It's a good idea to pack clothes that you can layer in case an unusually cool or warm day sneaks up on you. You can bring light cotton shirts and pants in hopes of sun, but also pack a few sweaters, warm socks, a scarf and a spring coat. March can be a wet month, and Paris is well-known for its erratic and sudden downpours. So make sure to pack an umbrella that can withstand strong rain and wind. Make sure to pack a good pair of waterproof shoes. Rain during a March trip to Paris is likely, and you don't want to ruin your excursions with sloshy shoes and cold, wet socks. London has similar temperatures and would do well with similar packing strategies. So, I think one important thing to make sure to have is a heavy weight sweater. 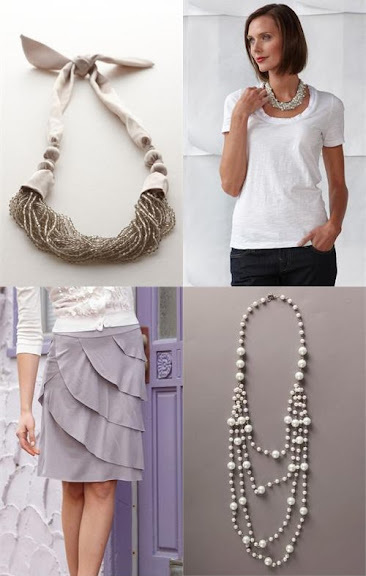 These are great for layering on cool days or to wear under a spring coat for extra warmth. For footwear, I think the best option for cool, rainy days and walking through the city is a flat leather boot. I have a pair of these, and they are infinitely versatile and super comfortable. Also, make sure to check out clearance racks at department stores and places like TJ Maxx (where I found my Steve Madden's for $50). Now is the best time to get a great deal on boots. Just make sure the items you bring are good for mixing and matching outfits. I will be the first to admit I am not a great packer. I bring 6 pairs of jeans and 20 shirts to Alaska for 6 weeks and end up wearing 20% of what I brought. But the ladies at Academichic know a thing or two about packing to mix and match on a trip. Read a few of their tips here: 1, 2, 3, 4, & 5. What do you all think of the tips? Do you guys have any other tips to share? Leave your comments below! What do you think? Is this something you would wear? Leave a comment! 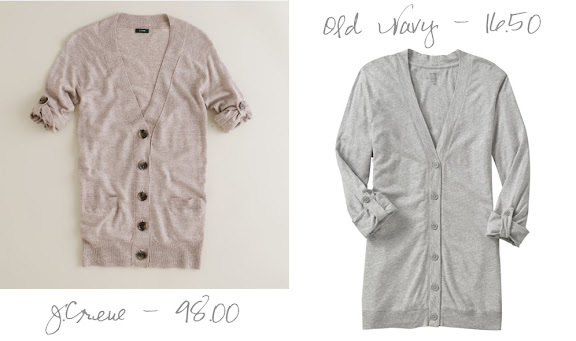 I spied this Old Navy Deal of the week, and I thought "Hey, I have seen that before." There are several color and pattern options, and the price is quite fabulous. 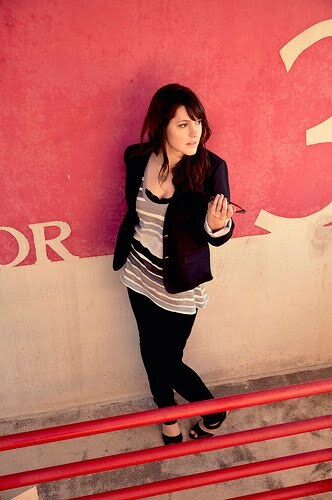 My favorite pattern is the blue and grey stripe (also sported by Kendi). According to online reviews this fits on the drapey side of things, so you might want to order down a size. So, after the positive feedback I got yesterday, I decided to open the Über Chic Boutique ASAP. The guidelines for submissions are already listed. So, start cleaning out your closets, ladies! I will post a few items of my own this weekend. If you use Google Reader, I suggest adding this to your feeds so you can keep on top of what is being added at all times. Make sure to check back, this site won't work without all of you! What do you think of the inspiration look? How about my picks? Leave a comment! I wonder when I am going to tire of these stripes that have burst on the scene this spring season. Not yet. You may notice a resemblance between this and the maternity top I posted last week. I was so happy to see this in the Women's section! Also, when did scoop necks become U-Necks? Did the apparel industry just decide that they are so similar to V-Necks they should be named similarly? Did I miss it, or did this new term just come on the scene? I'm attending our graduate school formal event, basically grown-up prom, next month and need help finding accessories to my dress. 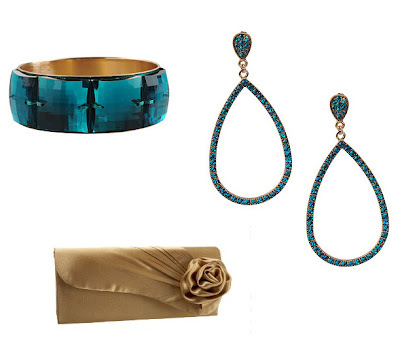 I bought this dress from white house black market and want to wear green/turquoise/gold accessories to match a bracelet I have, but am having trouble finding sophisticated looking jewelry to match. Ottoman Dress with Bow - White House Black Market - $49.99 (Orig. $150.00) - excellent find, Anjali! What do you all think of the picks? Any tips for accessorizing for a formal event? Leave a comment! I have a thing for J.Crew embellished tees. I have caught myself looking at this one quite a few times. Usually I look at these things and think I could do that, but I could not do this. It's just too intricate and fantastic. I hope you all have a wonderful three day weekend! PS- President's Day is chock full of fantastic sales. Hit up Chloe's new blog, See Chloe Shop to read about some of them! Yesterday, I made my own bow belt out of ribbon for my sewing project extraordinaire. I love what I made, but it was hard and time consuming! 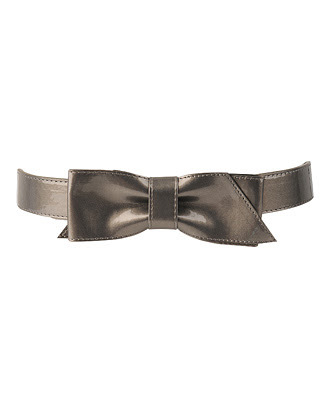 I saw this belt a few days ago, but decided that I really wanted I ribbon belt to mimic the original feel of the project. If I had it to do over again, I think I might have just bought this. It's too cute and you can't beat the price. What do you think? Something you would wear? Leave a comment! 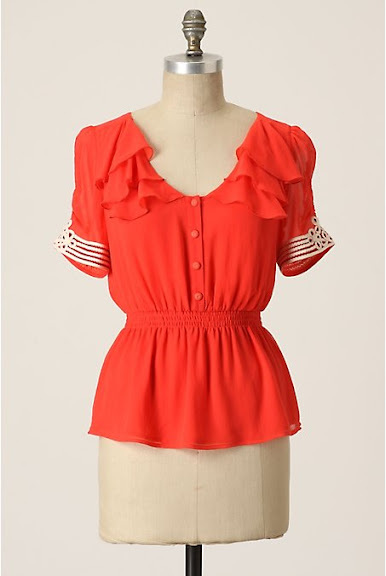 As soon as I saw the tutorial for the DIY ruffle front shirt at Tea Rose Home, I knew I wanted to make one. 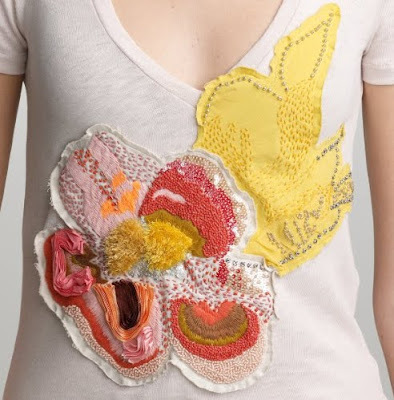 Then, I saw the Anthropologie Free Flow Tank, and decided I could utilize that technique to make a similar shirt. I am in the throws of the project now, and will share more details on how I did it and maybe even a picture of me in my shirt when it's done. We'll see. Anything you guys are craving to make yourselves this week? Leave a comment! If you decide to order anything from the last Old Navy maternity post you should know that Old Navy is offering free shipping on maternity (+ kid + baby) orders over $50. Use code "ONGIVE50". Also, Use code "ONSAVE20" to take 20% off your purchase of $100+ in Women's (or Men's!) clothing, or use code "ONGET30" for 30% off one adult item, or cardholders can use "ONGET40" for 40% off one adult item and "thankyou" for an additional $10 off that. Holy Smokes. As far as online deals go, these are awesome. Ruffle neck cardigan (for $8.55 + shipping!) here I come (as they don't seem to be coming in store). What do you think of the picks? Leave a comment! 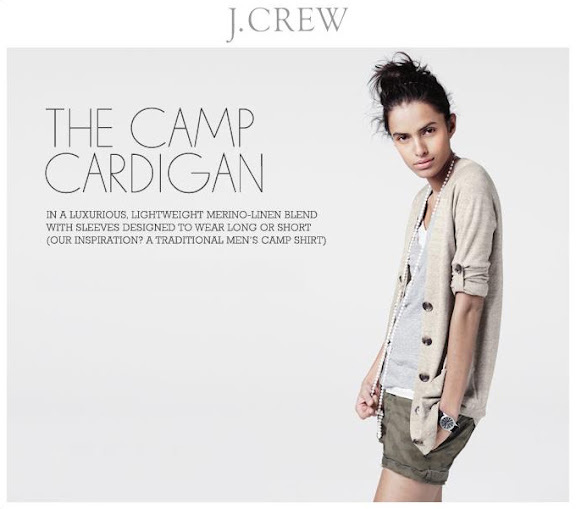 A few weeks ago, J.Crew sent out this email introducing their new Camp Cardigan, with sleeves inspired by a men's camp shirt. A quick note about the giveaway comments. I am actually pretty sure this doesn't apply to those of you who read everyday, because you are all fabulous. But I had a few readers submit WAY more comments than I allowed without following the rules. I want you to know, that it doesn't help your cause. If I give you 6 chances to enter, use them and follow the rules, otherwise comments will be deleted. A big thank you to all of you for participating. It was, as usual, a blast! Apparently, Tulle always donates 5% of their profits to charity (which is awesome). But, this weekend they are dontaing 50% of their profits to Haiti Relief. So, in my mind it's an awesome deal because I want to donate to Haiti anyway. So, this way I get something cute and money is going to a good cause, win - win. I think I will take the plunge on either 2 or 4... which would you choose? Is this deal enough to make you want to buy this weekend? I am not sure if I could carry this color of red with my complexion, but I would sure try! What do you think? What's your fashion dream this week? Leave a comment? Oh! And don't forget to enter the giveaway. Sequins have been everywhere this year. Usually sequins remain holiday fair, and as soon as spring lines come out the sequins drop off. According to my, uh, one source about what actually goes down the runways, sequins and metallics will stay in vogue through spring. Hooray for sparkly things. I, personally, like the idea lighter colored sequins and metallics for spring. 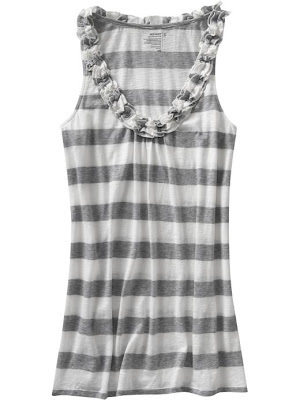 A few weeks ago, American Eagle came out with this tank (I saw it blogged about here and here), and yesterday I noticed a similar find at J.Crew. 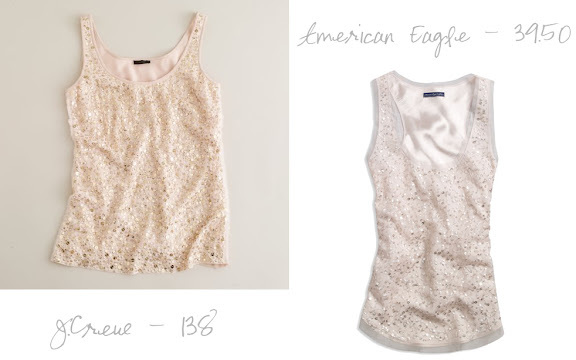 They are a little different in shape, but the American Eagle top's chiffon trim is a nice touch. What do you think of sequins and metallics for spring? How about the look for less? Leave a comment! Shade sent me a straight skirt to review! I have had my eye on this skirt for weeks, and am so excited to finally have one. Below, is how I would wear it. This skirt is such a great addition to my wardrobe. I love that it has pockets and pleating at the front. My other favorite thing is that it has a kick pleat rather than a slit in the back, giving range of motion without everyone in the world seeing your mid-thigh - fabulous! 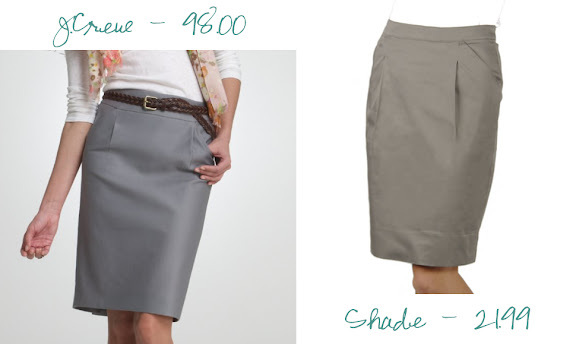 It's available in three colors: grey (shown), black, and the beautiful peacock blue. 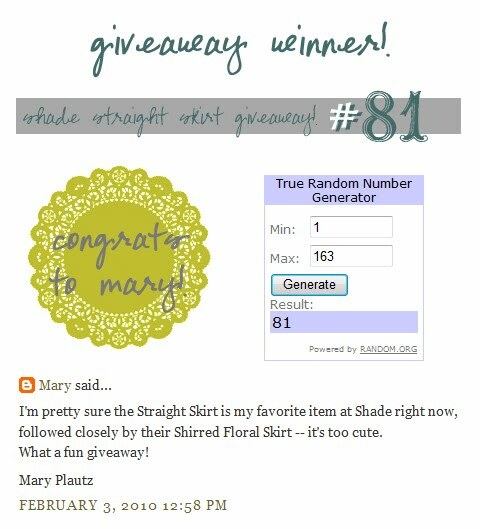 I am so excited to give away a straight skirt to one of you lucky readers! EACH entry must be notified in the form of a comment on the blog. The winner will be determined by giving each entry a number and using random.org to select the winning number. Anyone can enter (including you, anonymous readers). Just comment below with your first and last name and a valid email address so I can contact you if you win. -Leave a comment telling me your favorite item at Shade. -If you are a follower of my blog, comment to let me know. -If you are a follower of the shade blog, Your Life in Shade, comment to let me know. -Post about the giveaway on your blog and send me your link, and leave a comment. -Facebook about the giveaway and leave a comment. -Tweet about the giveaway and leave a comment. The Giveaway ends on Sunday, February 7, at Midnight (Mountain Standard Time). 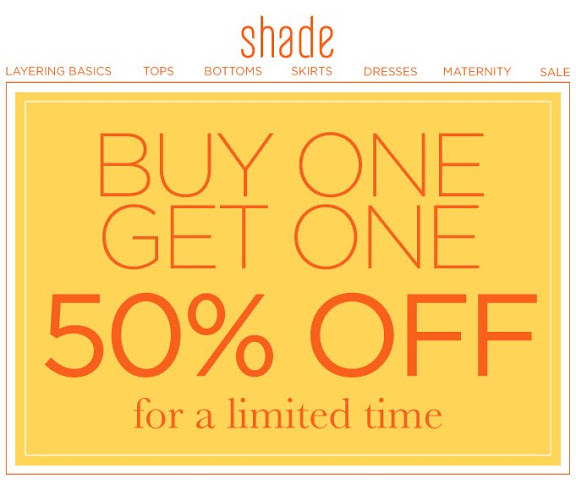 Also, this week Shade is offering a Buy One Get One 50% off deal! The promo is good through Mon. Feb. 8. So, if you are thinking about it, don't hesitate to take the plunge!